The week 9 reporting, for Wednesday February 29 - Tuesday March 6, is now posted at the IESO site, and I have updated my version of weekly reporting too. The overall weekly demand and pricing figures show the same trends as the past several weeks have shown, but looking closer at the data the developing break-up of Ontario's electricity plan is indicated. 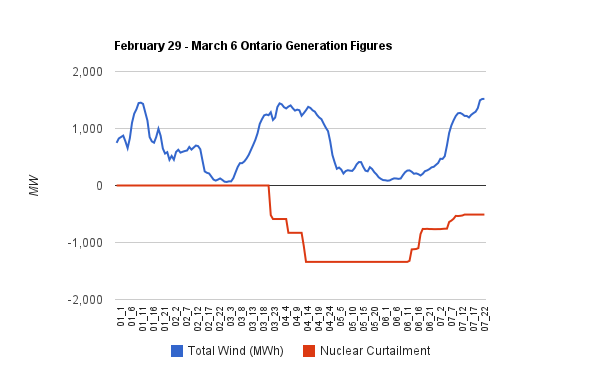 While Monday, March 5, saw the highest Ontario demand since January, the weekly demand average was down (376MW) compared to the same week a year earlier, the peak was down (335MW), and, due to the warm windy weather that preceded the cold still Monday, minimum demand was down 510MW (coincidentally the capacity of the Pickering 7 nuclear unit). The highest price was, temporarily, 7 pm Saturday night, as it has been the past couple of weeks. But Sunday at 7pm passed all other hours by a lot - $389.66/MWh. That pushed the average off-peak rate above $30/MWh for the week, while the average On Peak rate was only around $22/MWh. Fans of strict market pricing can't be happy about warm dinners. I'm looking at a future demand side campaign: "cereal, it's not just for breakfast anymore" -- and as the collapsing demand drives prices higher for all those who can't afford to purchase windows/doors/insulation, etc; "dogfood, it's not just for dogs ...."
Depressed pricing was accompanied, as it has been for years, by increased net exports - averaging 1360MW per hour (coincidentally about the generation capacity of Pickering 7 plus Bruce 8). There still hasn't been an hour, in 2012, when Ontario was a net importer of electricity. My tools for tracking curtailed sources of power weren't very helpful this week, as the non-utility generators continued producing, Saunders output wasn't redirected to Quebec (their reservoirs probably didn't get drawn down much this warm winter), and the 4 Bruce B reactors didn't bypass steam away for the turbines to avoid outputting full power. They don't announce the idling of reactors, and they don't generally idle reactors - but this week the evidence that they did is compelling. 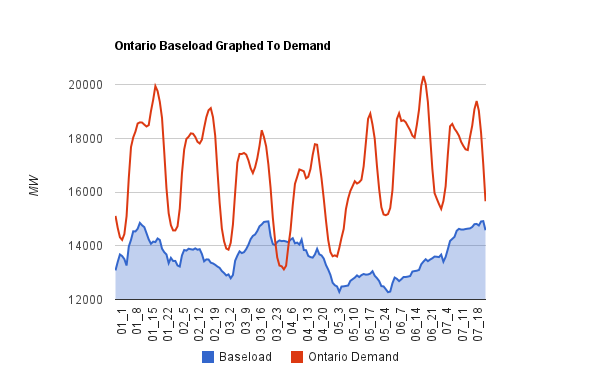 I've added a graph to my weekly reporting showing what I track as baseload against Ontario's demand. The sharp downturn in baseload supply, occurring just before demand drops below baseload supply on Friday night (03_22-23), is Bruce 8 being taken offline (the graph begins on Wednesday morning). The IESO recently posted a presentation indicating how dispatching off a nuclear reactor increases emissions - and my weekly reporting does show coal-fired generation surging, rising 118GWh beyond the level of the same week in 2011. The IESO models show gas, but coal is, arguably, better to offset large swings of wind output, and the wind was expected to die off Saturday night. In preparation for a big change in wind output, it looks like another nuclear reactor, Pickering 7, was idled on Saturday afternoon. The Bruce 8 restart commenced Monday afternoon, and Pickering 7 was scheduled to return Wednesday afternoon - although warm temperatures and high winds seem to be keeping it idled. I saw a fresh reference to Siegmar Gabriel today - a man I quoted in an earlier article - one demonstrating how renewables impacted Germany's electricity system. He is now one of the most powerful politicians in Germany - even referenced as a possible successor to Angela Merkel. It's time renewable advocates admit they aren't combating climate change, but nuclear power. It's time for our government to either stop being ignorant, or to stop lying. Another reason why RH Saunders output has not been redirected to Quebec recently is the current lock-out at the Rio Tinto Alcan smelter in Alma. Under the RTA-HQ contract, HQ has to buy the extra output of RTA's generation assets in the Saguenay-Lac-Saint-Jean during what the contract describes as a "force majeure". According to news reports, HQ bought 200 GWh in January and 300 GWh in February at the large industrial (L) Rate (~$47/MWh). This was headline news in Le Devoir this morning. That factor, on top of the mild weather we had here may explain a decrease in Ontario's exports to Quebec.